treat multiple properties together, versus installing BMPs on each individual property. Hover over a shaded area to learn more. There are benefits to implementing regional treatment including cost sharing of installation and operations and maintenance. In this scenario there is a conveyance system at the end of the driveways, conveying water to a vegetated swale in the right of way. The vegetated swales have rock check dams convey water to a dry basin. 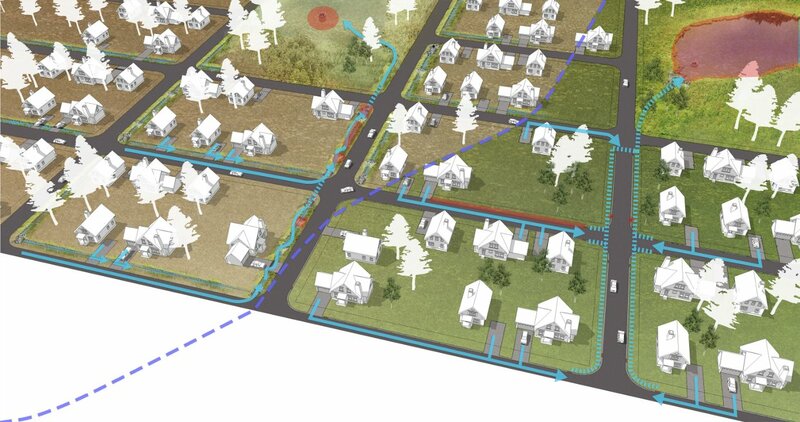 Properties in this neighborhood are constrained due to high ground water and proximity to a Stream Environment Zone, which makes it difficult to install infiltration BMPs on-site. This is an example where regional treatment may be beneficial. In this example properties have all source control in place, meaning that the property is well vegetated and mulched and there is no erosion occurring on-site. The stormwater runoff is leaving the property and conveyed through the neighborhood through a series of curb and gutter, drop inlets and storm drains that eventually discharge the water to a wet basin.